La Belle Province is aptly named and no city reflects better than Québec City. In addition to being the province’s capital, Québec City is a history buff’s nirvana. There is so much to see and do in and around Québec City, for young and the young at heart. 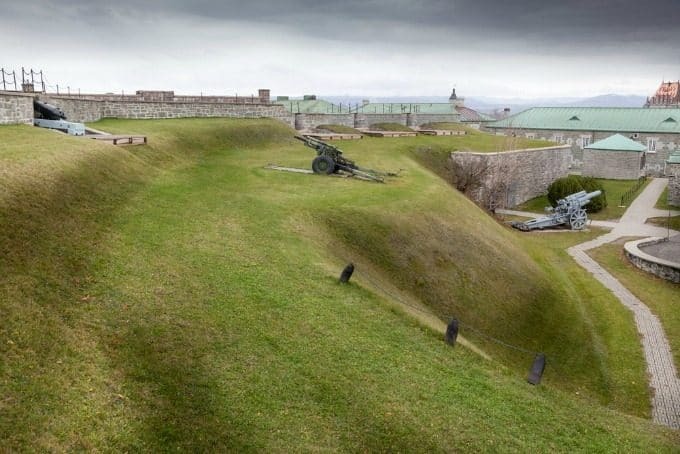 While a fort has existed on the site of Québec City since 1535—thanks to Jacques Cartier— the founding of the city didn’t officially take place until 1608, by Samuel de Champlain. The fortified city walls of the Old Town (Vieux-Québec), known as La Citadelle, are just an example of the historical context within which you can experience Québec. The Plains of Abraham (Plaines d’Abraham) is the location of the famous French – English battle with General Wolfe at one end and General Montcalm at the other. Spoiler alert: the English won. 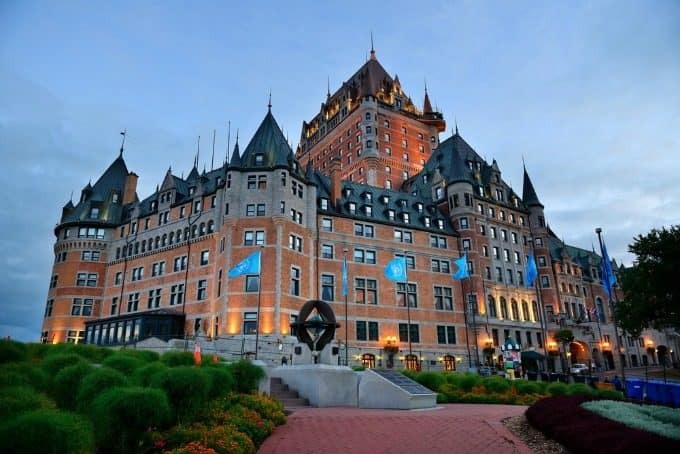 Located on the edge of the St. Lawrence river, Québec City retains its old world charms with the cobble stoned streets of the Old Town, the Chateau Frontenac, and the Plains. 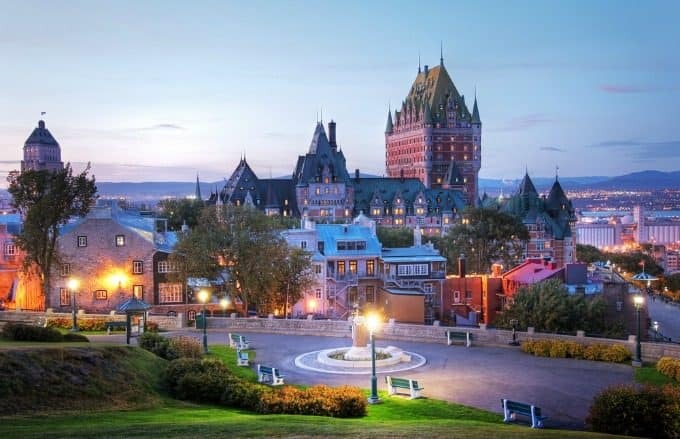 While today, public administration within the provincial government represents the lion share of the jobs in Québec City, tourism is another major contributor and it’s easy to see why. The list of things to do in and around Québec City is LONG. Vieux-Québec — A UNESCO World Heritage site, the old city is an architectural marvel that functions beautifully to welcome tourists from all around the world. Thanks to the deep basin of the St. Lawrence, cruise ships make Québec City a port of call not to be missed. Horse drawn carriages, quaint shops and delectable dining are all in one walkable area. Quartier Petit Champlain and Place Royale, within the old town, are cobble stoned and preserved, to allow visitors a chance to imagine what it was like living there in 1608. Tip: The perfect time of year to enjoy this area is at Christmas, when all the shops are decorated and lit up for a beautiful holiday season. A few steps from there is the Musée de Civilization, which will share with you exhibitions from the past, the present, and the future. La Citadelle — The star shaped citadel, fortified walls, cannons and walkways are all as they were several hundred years ago. More or less. Even the changing of the guard is an ongoing tradition but don’t worry: you won’t be held up at musket point! You will learn about the history of the city and how life was under the English and the French. The Boardwalk and Chateau Frontenac — In the winter, you can watch people slide down an ice chute and don’t forget about the Winter Carnival. In the summer, you can stroll the boardwalk in front of the Chateau and enjoy an ice cream and a beautiful view over the St. Lawrence. If you aren’t fortunate enough to stay at the elegant hotel, you can still peruse its beautiful lobby or perhaps partake of a little libation in its cozy bar or restaurant. The Vieux-Port — The harbour is an essential part of the city’s economic success and it is also worth a visit. There you can find a market, beautiful bike and walking paths, and very often a busker or two, at least in the warmer months. From there, you can stroll or bike through the Promenade Samuel de Champlain, a 2.5 km long park path that winds its way along the waterfront. L’Aquarium du Québec — Marine mammals, exotic fish and sea creatures share the space of this gorgeous centre. You can meet harbour seals, learn about polar bears, touch a ray or starfish, or simply enjoy the tanks or the deep ocean tunnel, surrounding yourself with an amazing array of sea life. 10,000 specimens, to be exact! 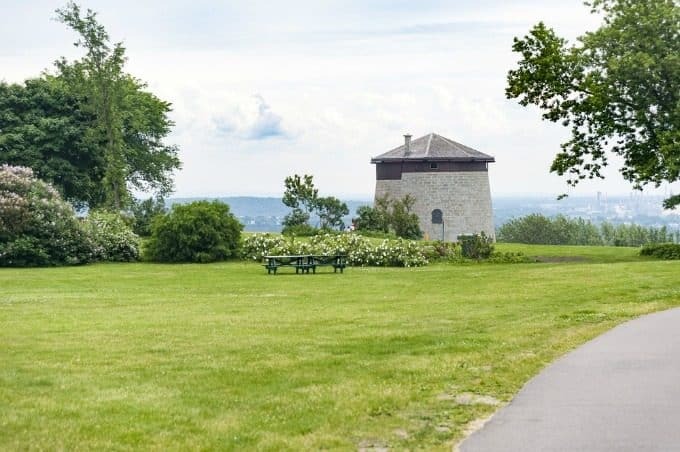 The Plains of Abraham — You can practically feel the cannons booming in this gorgeous and preserved green space; a perfect spot for a picnic or a game of hide and seek and a frequent locale for summer concerts and events. Ste-Anne-de-Beaupré Shrine — Like Lourdes in France, the shrine at Ste-Anne-de-Beaupré is a pilgrimage site that attracts over a million tourists and visitors a year. Even if you’re not Catholic, the site is extraordinary and peaceful, with towering stained glass windows and priceless works of art. 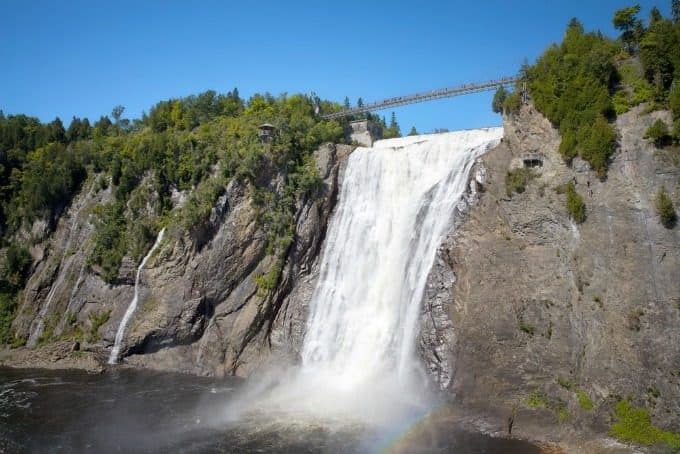 Montmorency Falls and L’Ile d’Orlèans — Heading a little ways out of town, you can visit the Chutes Montmorency by hiking the trails, on a gondola ride or, if you’re daring, via zipline! The eighty-three metre high falls are worth a visit up close, or across the bridge, from the Ile d’Orlèans. This island is a picturesque place you can tour by car in a day. Just drive around the outer perimeter and enjoy the views as the St. Lawrence flows down both sides. Fruit wineries, sugar shacks, and farm stands abound, along with the steep roofed homes that characterize the area. Of course, any description of Québec City wouldn’t be complete without paying special attention to the winter happenings. The annual Ice Hotel is built in Québec City and even if you’re not brave enough to stay the night, you can tour it. It’s a marvel of engineering well worth braving the cold for. And we can’t forget Winter Carnival! This annual tradition of events includes the International Snow Sculpture competition, parades, the ice canoe race, dog sledding, tobogganing, and street celebrations throughout the old town. Bonhomme Carnival is waiting for you in his ice palace so take your snow suit and get ready to party! Have I missed your favourite Québec City attraction or event? Let me know! 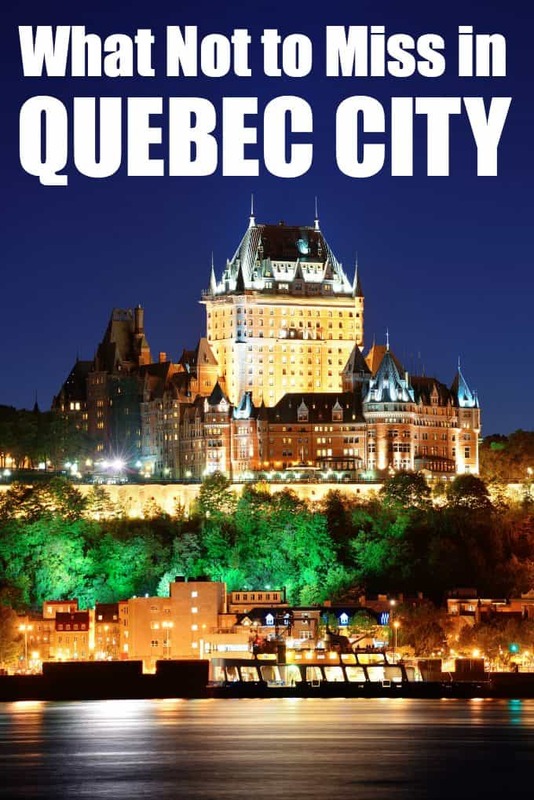 Thanks,i have never been to Québec City but it sure sounds like a lovely place to visit! These sound wonderful! My husband and I haven’t been to Quebec in YEARS– probably close to 8! I just loved the cobbled streets and we got to eat lunch at a revolving restaurant with beautiful views of the city. The Chateau was my favorite though and all the street performers… the french accents and food.. it was wonderful! We live on the East Coast of QC. I’ve been to Montreal twice due to my transplants (active) and it’s a beautiful city with historical buildings everywhere you look. I can only imagine what Quebec City looks like. Very gorgeous countrysides here too. One of my favourite cities to visit! I’ve never been to Quebec but those photos show a marvellous city – mind you I do not like the thought of crossing that bridge above the falls at all! I am from Mexico City and just today I stumbled upon your lovely blog. I lived in Toronto when I was in junior high and then in Québec back when I was in High School, I have special love for all thing Canadian. I loved this post, I remember going up L’ile d’Orleans in the fall to go apple picking. Fall is lovely there, apple cider, candied apples, crispy wind and a magnificent view of the Fleuve.